Upon arrival at Geneva airport we were met by one of Hotel L’Apogée’s pristine vehicles and headed up to the mountains. At just two and a half hours, the journey to Courchevel is more than do-able for a short break or not too far if travelling with the family for a week. Once at L’Apogée we were greeted by inviting and friendly faces of the hotel staff and led to the Bar de L’Apogée for a tasty lunch. The bar menu is great for lunch or a light dinner with everything from burgers to ‘fish of the day’ dishes. The barmen here were so attentive and talked us through the wine choice of the afternoon while we waited for our order to arrive. After an early start that morning the hearty burgers went down a treat! My One Bedroom Suite was an absolute treat! It was so spacious, and with a separate bedroom and living area it made for a very homely space. There was also a full length balcony with mountain views over the front of the hotel, all of which are heated to prevent snow gathering. With only 53 rooms and suites at the hotel, every guest is made to feel very special and I was recognised by name by many of the staff members, a true 5-star touch! That evening we were driven down the centre of Courchevel 1850 by one of the on-demand drivers, to have look around the resort and enjoy an evening drink. The streets are lined with designer shops selling the most prestigious ski gear whilst there’s also a great selection of restaurants and bars. 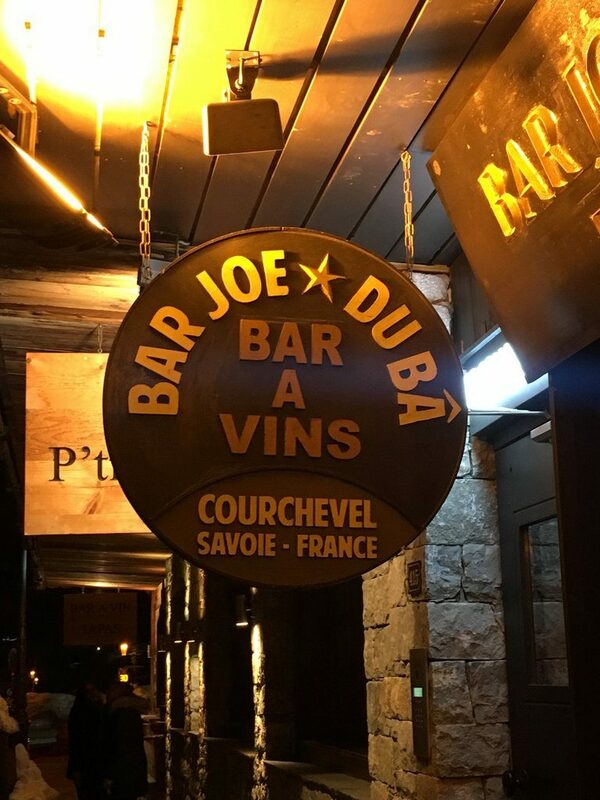 We tried out Bar Joe, a cosy après spot serving amazing drinks which went down a treat with some traditional French appetisers, including snails and a selection of cold meats. 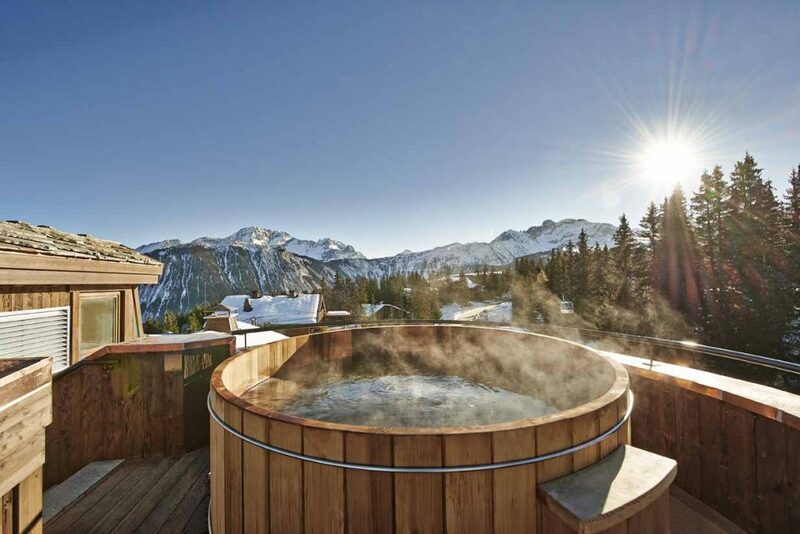 This is a great place to try out for a chilled-out drink after skiing! Staff at L’Apogee are on call all evening to drop and pick up around Courchevel, so after drinks we were picked up within minutes of calling and whisked back up to the hotel for a delicious tasting dinner at Le Comptoir de L’Apogée. This is one of two restaurants in the hotel which is a French brasserie style. The ultimate in ‘ski out’! The following day, after the most comfortable sleep and an amazing continental breakfast, we had our ski equipment fitted at the on-site shop and headed out for a sunny morning on the slopes. 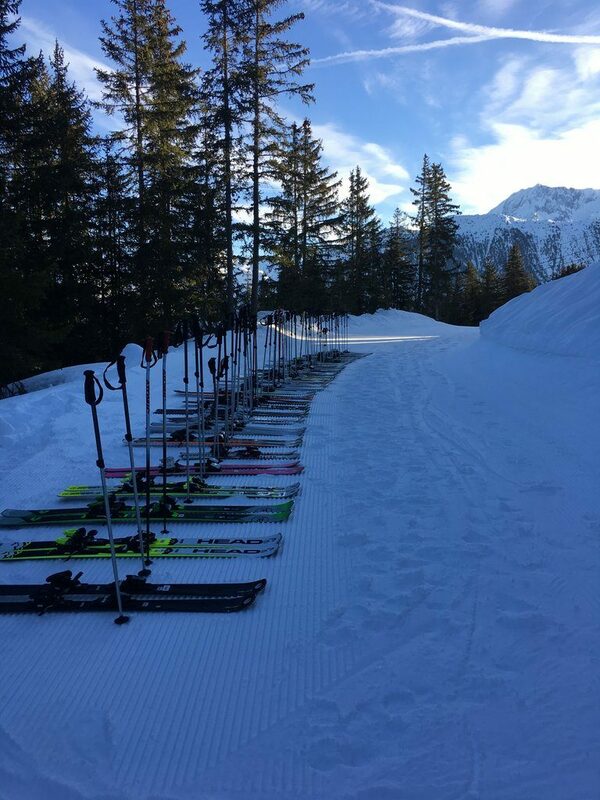 The impeccable service throughout the hotel continues right down to the rental shop where your boots are placed on your feet for you and equipment laid out on the snow ready to just click in and go! It was the perfect day for skiing, the sun was splitting the skies and from the huge amount of snow over the past few weeks, the pistes were groomed to perfection. 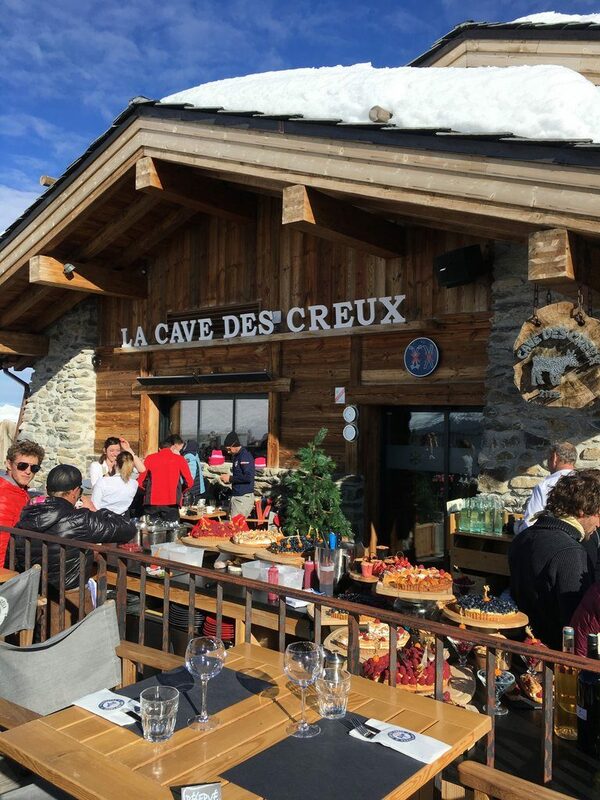 For lunch, we dined at La Cave des Creux which is located on the slopes and can be accessed from a blue run, meaning all the family can enjoy this wonderful spot. There’s a terrace outside to enjoy the sunshine or you can sit in on colder days. The menu has a huge range of French cuisine with one of the specialities being their fondue which looked delicious! A must-visit for all! 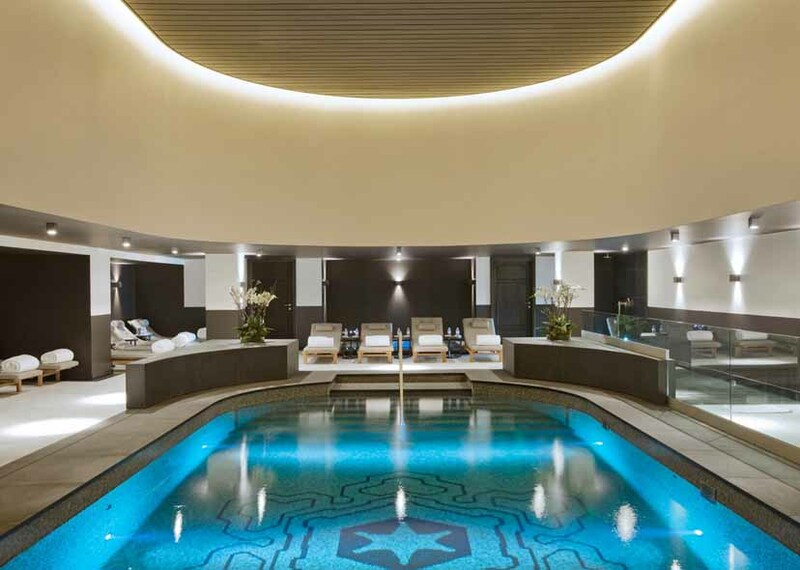 With tired legs from a morning skiing and full to the brim with hearty food, we headed back to the hotel where we were all treated to a luxurious treatment in the spa and the afternoon to relax and enjoy the pool and Jacuzzi. The therapists here were very knowledgeable and able to advise on the best treatments for your requirements – along with your choice of scent and oils if you were to go for a massage. Nothing was too much hassle and they brought me a fresh mint tea to enjoy by the pool after my treatment. It’s a tough life! 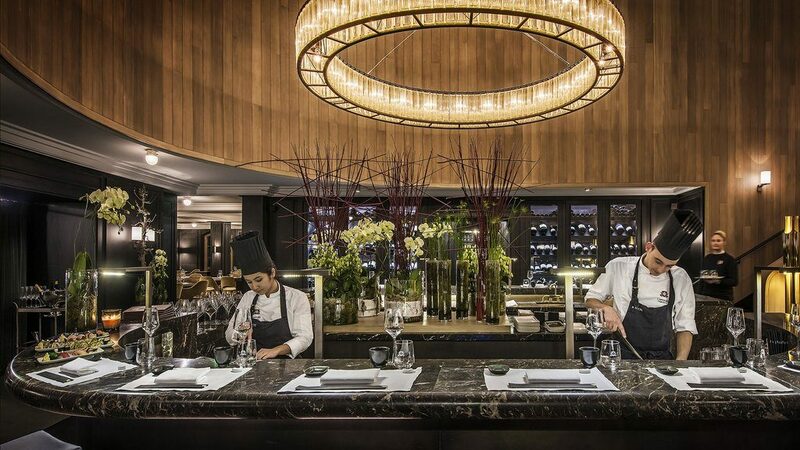 Dinner that evening was at Le Koori, the Japanese restaurant at the hotel which serves traditional sushi dishes and also a selection of à la carte meat and fish dishes to suit all guests’ preferences. Again we had a tasting dinner so were able to sample a range of dishes but we could also see a few tables around having a sushi platters too. Even though we were eating in a different restaurant, we were served our preferred water and wine without even having to be asked, which just proves once again that the service here is a step above the rest! And, although the 48 hours of luxury was coming to an end, we did have time for one last activity the following morning. We were taken on a snow-shoeing tour through the forest and down to Lac de la Rosière. An amazing experience to take in another side of the resort. There had been lots of fresh snow overnight so the trees and paths had an extra dusting making the views particularly beautiful. 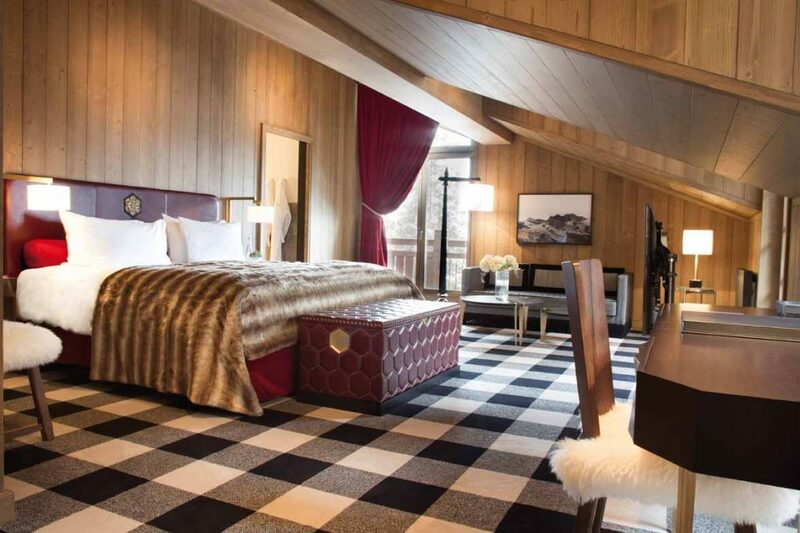 This was a great way to end the most luxurious ski trip I have ever been on and I can’t wait to send clients here to experience what an incredible hotel L’Apogée is! 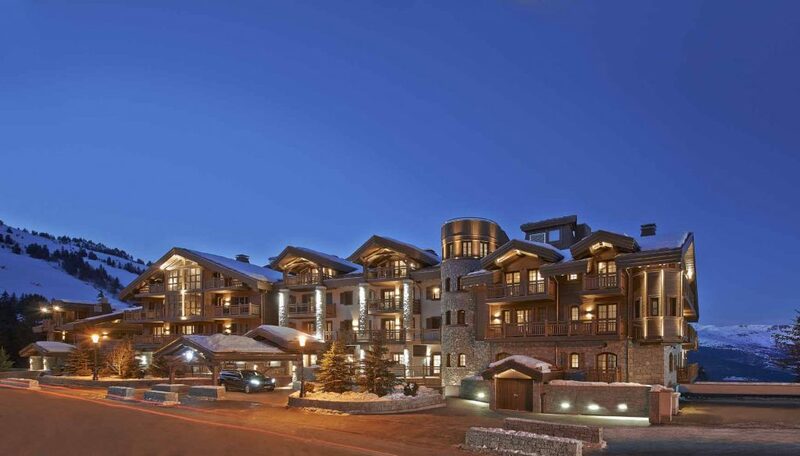 For more advice and to arrange your next luxury ski getaway, contact our team of Ski Specialists. Call the team on 0131 243 8097 or request a tailor-made quotation online.